As your organization implements Groups and Tags, you may be wondering when to use a Group or a Tag. To help you with this evaluation, below are some considerations to assist you in making the determination that is best suited for the need. Prospective Group members can register for a Group via the Group Locater. 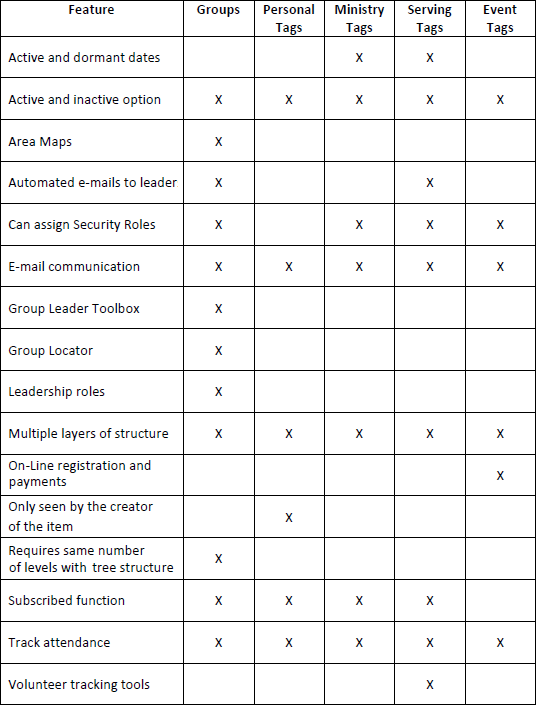 Group Leaders can access the groups to which they are a leader of via the Group Leader Toolbox where they can manage group members, communicate with group members, take attendance, view and print group rosters. Use Group Area maps to reflect members and groups on an area map. Designed to use for events with beginning and end dates. Has an option for online registration. Integrated payment gateway required. Prospective volunteers can register on the Arena-managed portal where Arena can email the Tag Owner of the prospective volunteer. Use enhanced Tag Status to manage volunteer processing, including email notification of critical prospects. Use the reminder notification option to remind volunteers of the next time they are schedule to serve. Use to manage other collections of records that are not a group, event or serving tag but should be available to more than one staff member. Use to manage collections of records that are specific to the current user. •Ability to organize so you can have as many levels as needed per Group or Tag. •You can set view and edit security for each tree structure and level. •Individual records can be in more than one Group and/or Tag. For Groups, records are added at the lowest level of the Cluster Type. •Attendance Types can be attached to a specific Group or Tag for the purpose of using Check-In, printing rosters and taking manual attendance. •Users can send emails or Text Message (SMS) communications from a Group or Tag. •Users can use the Person Bulk Update from a specific Group or Tag. •Users can Word Merge (such as labels) all or selected records from a Group/Tag. •Users can export all or specific records in a Group or Tag to Excel. •Users can make individual Groups or Tags inactive for archiving purposes. •Users can make individuals active/inactive in Groups and Tags. •Users can upload documents to a specific Group or Tag.